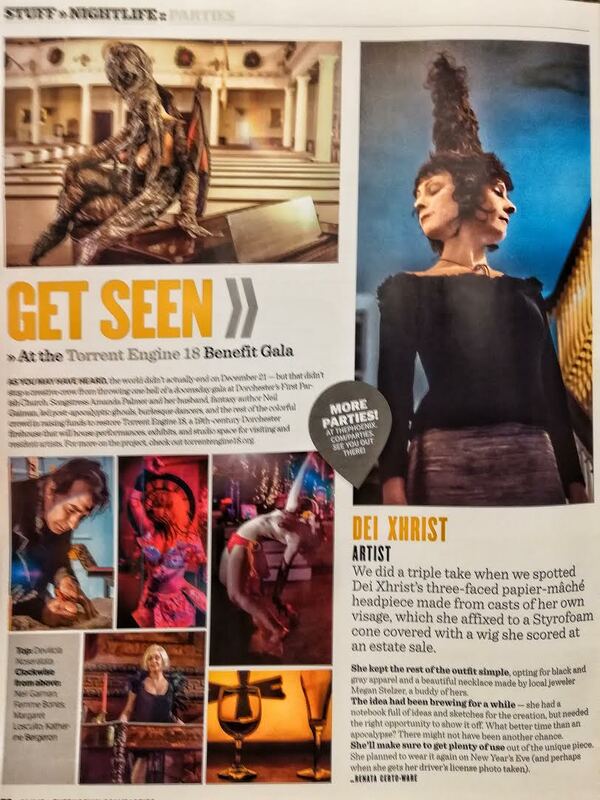 When an electrical fire tore through Pan9 six years ago, a handful of artists who lived and worked in the Warholian underground Allston art space (where the Dresden Dolls played their very first live show) were left homeless, among them Katherine Bergeron and E. Stephen Frederick. Bergeron, a/k/a Katrina Galore when performing for The Slutcracker or Walter Sickert & the Army of Broken Toys, says that the fire's devastation went far beyond physical loss. "It's difficult to convey with words how special Pan9 was, and how special it was to people when it died," she says. 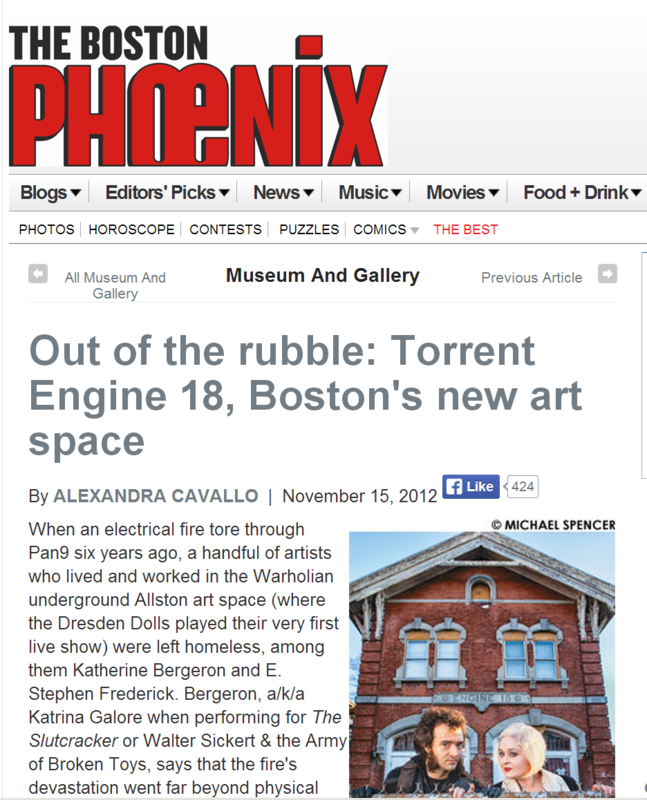 It was that loss that inspired the couple to found Torrent Engine 18, a 19th-century Dorchester firehouse that Bergeron and Frederick (curator of the "multimedia assault on the senses" known as the Empire S.N.A.F.U. Restoration Project) are transforming into a flexible arts space they'll also call home. They're funding the project through a Kickstarter campaign, for which they're asking for a mere $10,000. ("A friend joked, 'Where's the extra zero?' " Bergeron says with a laugh.) The campaign launched on November 1, and at the time of this interview, just four days in, they'd already raised more than half of that amount. 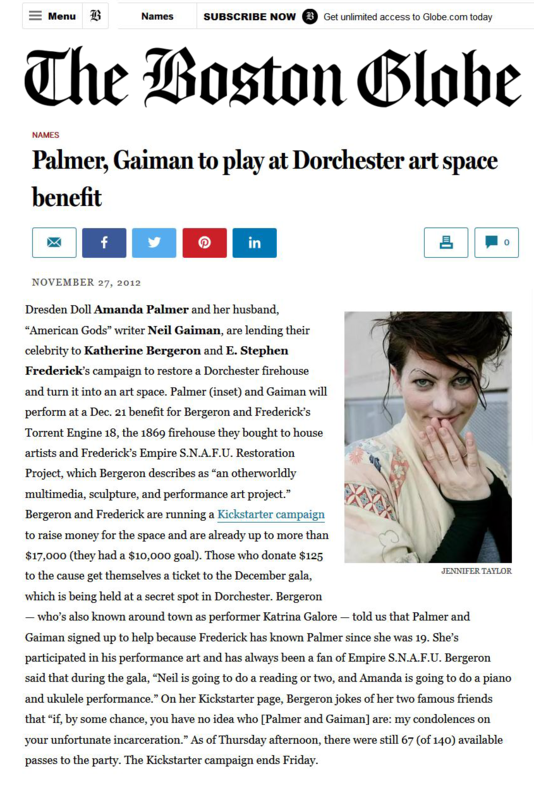 She attributes this swift and rather remarkable response to Boston's tight-knit arts community. "I wouldn't be able to do what I'm doing somewhere else," she says. "It has to do with trust. People know that we're willing to go to the ultimate limit to make this place as great as possible. We want to make it a destination for underground art; that is our exclusive goal." Bergeron, who holds a day job in education administration at Harvard while Frederick puts in a 40-plus-hour work week as "foreman and superintendent" of Torrent Engine 18, says they hope to open the new art space's doors as early as this spring. It's a race against the clock as winter approaches, and the couple — along with a dedicated crew of volunteers who are contributing labor instead of or in addition to monetary donations — are restoring the decrepit building almost entirely by themselves. It's going to be a lot of work, but, as Bergeron puts it, "We wouldn't have tackled this project if we didn't think it was important, in fact, urgent." She laughs, "And you have to be a little bit insane."